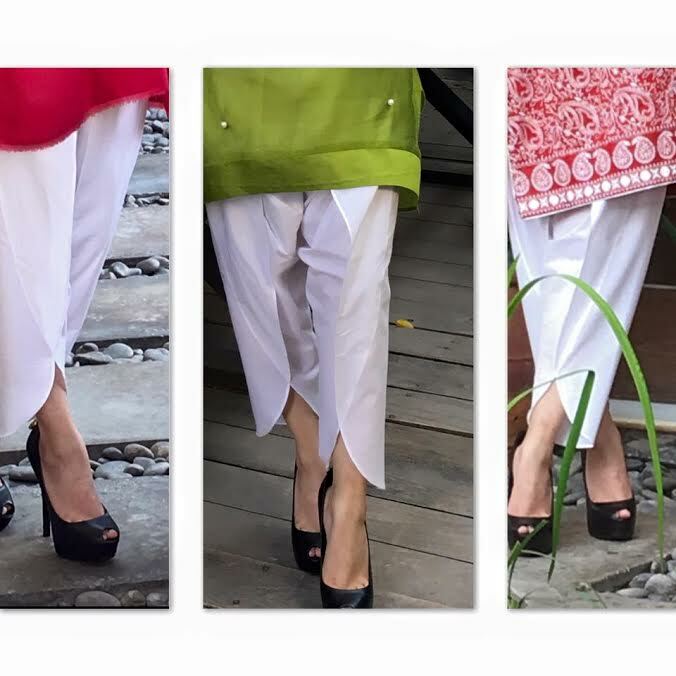 Latest shalwaar fashion in pakistan from tulip shalwaar to bootleg/cropped culottes. Home › Fashion › Keep Calm and Summer On – What’s On the Bottoms Menu? I have always been big on (desi) fashion – I like following the latest trends and trying on the newest silhouettes. I find spring/summer 2016 particularly interesting because EVERYTHING IS IN! And the best part is, there is so much to experiment with in the lowers/bottoms department. There are cigarette pants, culottes, bootleg pants and the good ol’ shalwaars in various cuts. Since the last few days have been a little less taxing at work, I had the chance to go shopping and stock up my wardrobe with new stuff. 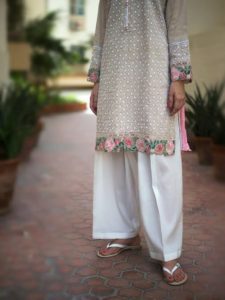 While shopping for kurtas has been a little boring (same digital and floral lawn prints everywhere mostly), pairing them up with fun bottoms has given my life tons of excitement. So I am going to share with you what all I have done to gear up for the summers and, I tell you, the process of gearing up for the summers has been very cathartic, let me share it with you, and also tell you how I plan to look up-to-date throughout the season. The most essential item in your summer wardrobe: well-fitting pairs of cigarette pants – preferably in white, black and off-white. With these 3 neutral colours you will feel your life is sorted as there will always be one that matches with your shirt. It is also economical not having to match the exact colour with your kurtas. Since my pants from last year looked ancient from over-use, I replaced them with 3 new ones. I saved cost by getting the black and white ones stitched myself, and I bought the beige ones on sale. If you are in Pakistan, check out the cigarette pants available at Daaman, which fit great! Just as an example of what Daaman has to offer, take a look at these wonderful white cigarette pants! So glad that the boot-cut is back in the fashion scene around the world, and in Pakistan too. I love how our national dress can be made to work with fusion. Though I am not yet tired of the cigarette pants, which look great with any kind of kurta, it’s always nice to have some variety. 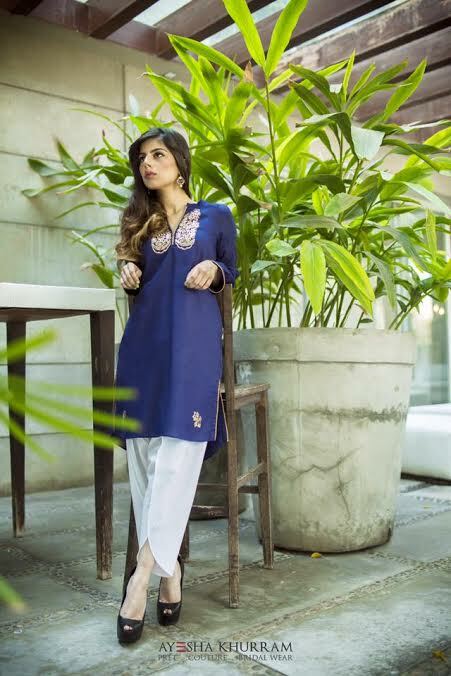 I bought this 2-piece suit from Sapphire’s second volume of lawn (please don’t judge me, I went after the aunty-tornado rocked Sapphire outlets on April 18) and got it stitched just like in the picture – a short shirt about 33 inches in length, with a pair of bell bottoms. I am loving the silhouette … and the change. I also got this pair of bell bottoms from Generation. I love the print, the unusual jade green base colour and the price at Rs. 1198! I plan to pair it with a short, plain-ish jade green shirt with same-colour lace applique on the sleeves. What do you think? Generation, by the way, has a lovely collection of bottoms of all sorts priced very, very reasonably, all of which can easily be paired with plain shirts. 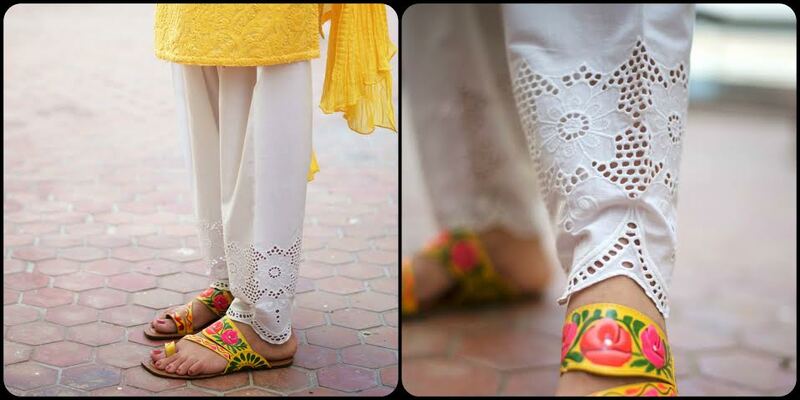 I am just loving these bootleg pants from Rema and Shehrbano for REMA! 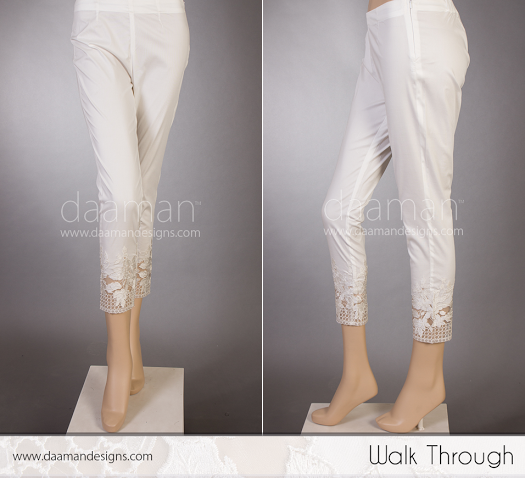 The organza strip detailing at the bottom give the pants a chic look, and these can be paired with more formal shirts. I think I will go for one of these this Eid! If you want to see more of REMA, you can click here. When it’s hot, we all need some air, which is why I love that the culottes, reminiscent of the azaars, are back in action. So hop on the bandwagon and add this must-have trend to your closets! This time around, I am getting them stitched in shorter length, so that they finish a little above my ankles. I bought some white fabric, got this organza lace appliquéd, and at a very comfortable cost, now have these really comfortable and pretty culottes in my life. I am keeping the paaincha 12 inches wide, pairing them with shorter length shirts. 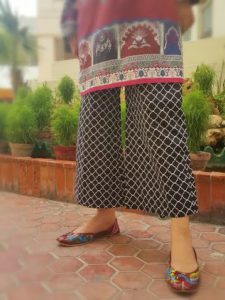 Wider-legged culottes are in too (not just in Pakistan but in the West as well) but I don’t think I will be investing in those as I buy/make what I can also use at work. And I definitely do not want to be sporting the gharara look at work … so these normal looking culottes will do fine. Do take a look at what Generation has to offer. I think a printed pair of culottes or two would add great variety to your new lawn jorras too! 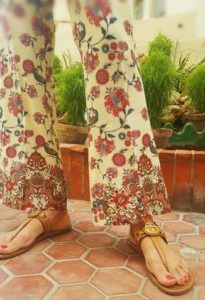 I got this pair of culottes stitched for my Zara Shahjahan print and I love them! By the way, I got this stitched about a month back, and already I am ready to shed off 2 inches from the length of my shirts. The shorter, the better! Loving my super matching truck art khussas! So. The shalwaar is back. Is that good news, or what? During the strict tights/cigarette-pants-only days, I would come back home from work and get into my old shalwaars. Confessions of a shalwaar-o-holic. So to get comfortable with wearing shalwaars in public when the season began, I got this guddi-kaat shalwaar made, which is kind of a pseudo-shalwaar; a little sleeker. Again, I am pairing these with shorter length shirts. White goes with everything so this one’s my staple – I miss them terribly when they go for a wash. If you feel more adventurous or are very passionate about shalwaars, consider the truly Pakistani kali wali shalwaar. You can choose how much ghheyr you want; I am liking this kind, with a decent sized ghheyr, not like the patiaala ones that we used in 2005, but still a quite a big paaincha. Short shirt, chuna hua dupatta, this shalwaar and a pair of khussaas – nice traditional look which I am planning on sporting during the summer vacations fo shizzles. The dhoti shalwaar has been renamed and relaunched as tulip shalwaar. I have hated it, found it super weird, questioned the purpose of its existence, had a coming-to-terms-with-it phase, and now I absolutely love it! There are two options with these – the sleek ones, and those with the ghheyr. I plan to go for the sleek look as dinner-wear, pairing with heels. The ghheyr one sounds good for day-excursions and would look so cute with khussaas or kolhapuris. What say? 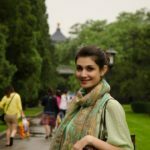 If you want ready-made ones in Pakistan, you can get them at Ayesha Khurram (Lahore), Gulabo and Misha Lakhani. The silver lining in my life is that they will soon be available at Beech Tree at a pretty good deal of Rs 1,450, yahoo! My tailor, on the other hand, has promised to stitch me a pair for even less! I need to decide sooner than soon because I have never done the tulip shalwaar, and really want to experiment with it. 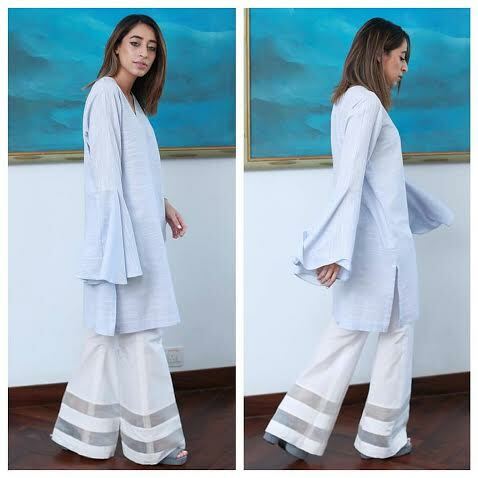 Looking at pictures, Ayesha Khurram is offering my most favourite style, and investing in a ready-made pair is probably safer as, who knows what the tailor might do! Check out more of Ayesha Khurram here. Another new kid on the block pulling me towards it with great force is the cowl shalwaar. I am loving the printed ones at Gulabo, priced a little steep at Rs.5,500. 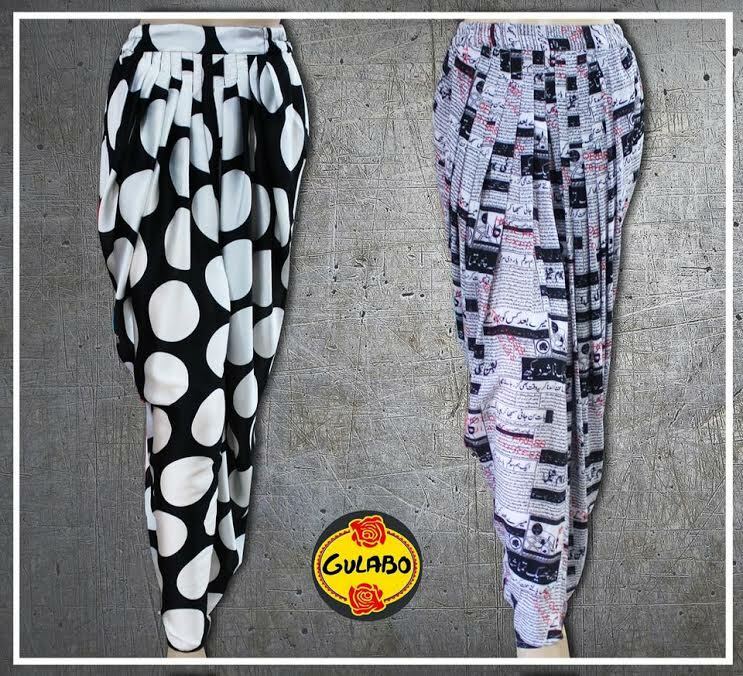 But, really, the modern prints combined with a traditional cut will make you drool; perfect for a casual coffee date with a friend! Or maybe a juice date in this heat. 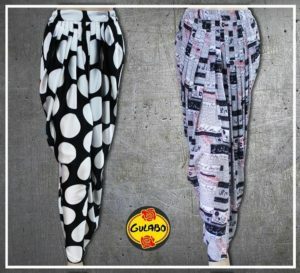 You can have a look at the options available at Gulabo here with ideas on how to rock the look! I shall be honest. I am holding on to my black pair of tights. I was worried it might be fashion suicide to still use them, but if Khaadi, Gul Ahmed, Beech Tree and Sapphire are still selling them, why not! Tights are super economical and very, very comfortable. You can do any sort of movement in them, and they will maintain their shape. So with some of my very western looking kurtas, I will be sticking to my black tights. I love them quite a lot. 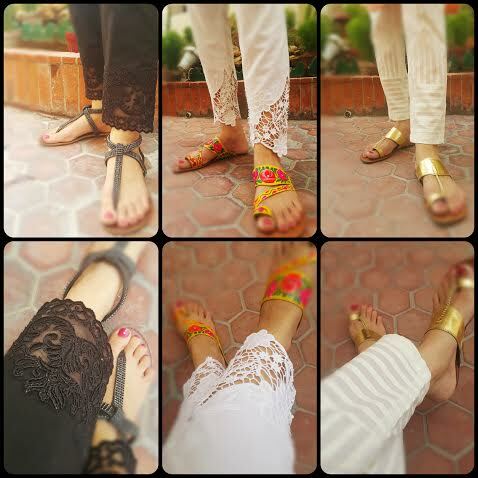 Khaadi has tights with minimalistic embroidery at the bottom if you find plain ones too boring. Nice trip down the Pakistani fashion lane? I sure do hope so! Let’s just say there are few issues in life that retail therapy and a plate of Biryani cannot cure. Your own hard-earned money, nice silhouettes to flatter your body type and a hot plate of Biryani will keep you feeling empowered for life. So go for each of these elements relentlessly and be happy! *For the black one, I got the lace for Rs.200/yard from The Plaza (the pathaan market at do talwaar in Karachi) and had it appliquéd for Rs.150. The fabric is stretch cotton (available at The Plaza and Aashiyana market) which gives my legs the room to move without fearing that my fitted cigarette pants will rip if I bend to pick something up. The fabric cost me Rs.400 (be nice to the pathaan at the time of purchase) and the tailor charges me RS.400 for stitching a pair of pants. Total cost: Rs.1150. I got the fabric for the white one from Lahore Centre in Lahore for Rs.900 – the lace at the bottom was part of the fabric. Hence total cost: Rs.1300. Images in this article have been taken from the websites/Facebook pages of REMA, Daaman, Khaadi, Gulabo, Sapphire and Ayesha Khurram. This article has such a great breakdown for all the different lowers available and details on where to find them. Plus, the author has written it with such infectious enthusiasm. Love it!